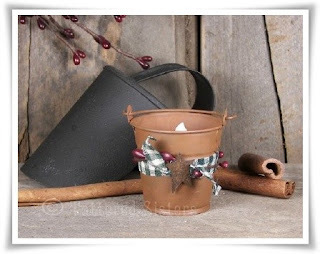 If you are wanting to create a really cute and Primitive Lighting project, I think you'll like my Mini Rusty Bucket Lights. To create these I just took a mini rusty tin bucket and first tied it with some homespun fabric. Then I added a little spring of pip berries, and topped that with a rusty tin star. I added a little bit of paper shred to the bottom of the bucket, and then I just added a battery operated tealight candle to it. And that is all there is to it! Super easy, and super cute. 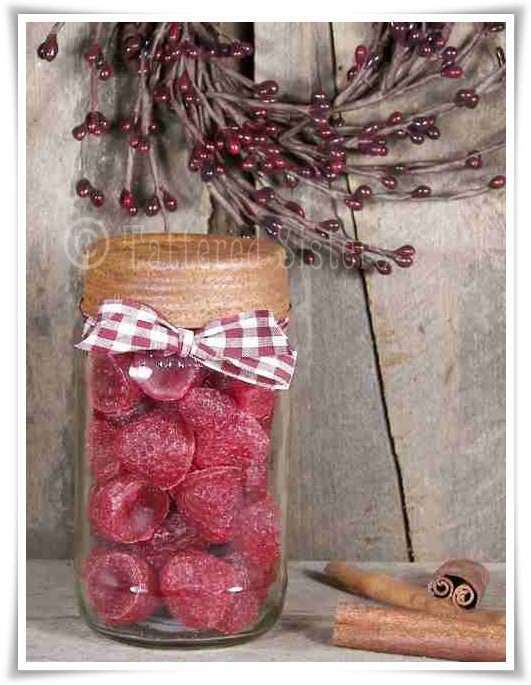 These are perfect in a window sill, on a small wall shelf, or even to put here and there around your dinner table for a little bit of warm flickering light. I even made a few to put on my Christmas tree since they are so small. And of course, they would make a cute little gift too. One day last year I was itching to try my hand at making a Penny Rug. I'd never made one before but just wanted to try one. So I decided to make this Sheep Mini Penny Rug. I started with a deep burgundy piece of felt, about 4x6" in size. Then I designed my sheep by drawing it on some cardstock to create a pattern, then cutting it into pieces and using those to cut out the felt pieces I'd need. I sewed the sheep together, and added a button on the heart that is on his blanket. 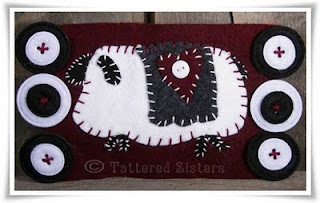 Then I sewed the sheep to the background. And for my "pennies" I used felt buttons that I found at the craft store, layering them together and stitching them in place on the edges of the penny rug with burgundy embroidery floss. It's definitely not perfect, and it's very small. LOL But I love how it turned out. One of these days I really need to try something bigger! 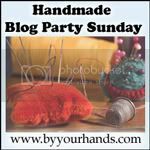 If you like primitive wax melts like I do, you might also know some other ladies who like them too. So if you're wanting a fun little gift idea for giving wax melts, then these might appeal to you. These are my Primitive Canned Fruits Wax Melts. Now first let me say that I did not make the melts themselves. Candles and melts are not my thing, so I bought these. But I thought these fruit-scented melts were begging for a fun gift-giving presentation. 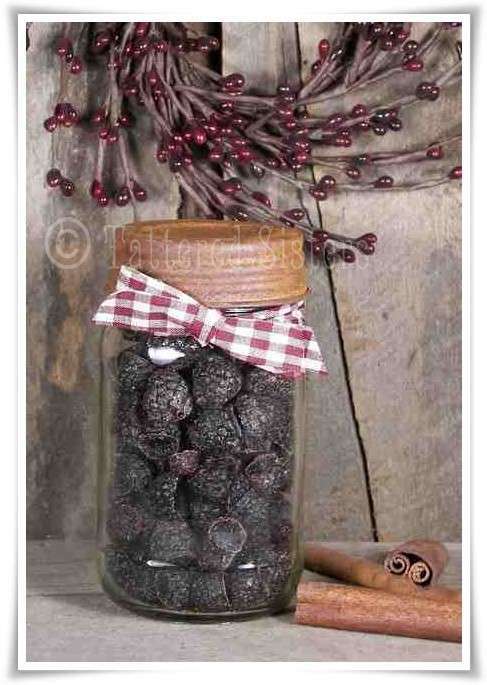 So I put them into square mason jars with rusty lids. Then I just added some primitive homespun to the top off the jars. These really look so cute and make great Primitive Gifts. Time to get grungy again, don't you think? I swear, getting grungy is kind of like a prim addiction. LOL This time I've made some Grungy Cinnamon Sticks. These Grungy Goods are made the same way I make pretty much anything else that I decide to grungy up. Just dip them into some melted, scented wax and then roll in cinnamon. Let them set until you've done all the sticks you want to do. Then dip them into the melted wax again in order to seal them. My little tip on the sealing step: don't dip them all the way down into the melted wax, as this will often cause all the cinnamon to come right back off; instead, use some metal tongs to quickly dip one side of the sticks in the wax, then let that dry, and then turn them over and do the other side. Dip quickly too--don't hold the sticks down in the wax for more than a second or two. You will lose a lot less cinnamon if you do it this way. 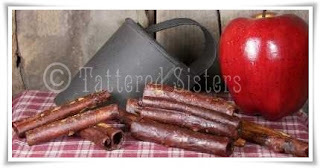 These grungy cinnamon sticks are great as Primitive Bowl Fillers. You can put them in a bowl all by themselves, but they look great as an accent with other things, like rosehips, or even Dough Ornies. This is a cute little primitive basket of Pip Berries that I've made and put in my guest bathroom. 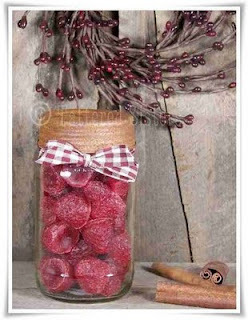 I love using pip berries in lots of rooms in my home. I just took a simple small basket, which is kind of green and black in color. I tied a piece of mustard plaid homespun to the front and then hot glued on a Rusty Tin star. Next I added a piece of floral foam to the bottom of the basket. 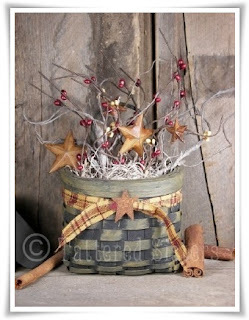 Then I added some pip berry stems, in burgundy and gold colors, and they also have rusty tin stars mixed in with them. Then I just covered the top of the floral foam with Spanish Moss. This basket has a little hook on the back so I could hang it if I wanted to. But right now it sits on top of the cabinet that's in the bathroom. OK, so I know hearts are really better suited for Valentines Day. But I was doing some Primitive Spring crafting over the weekend and really wanted to do a heart, but with spring in mind. 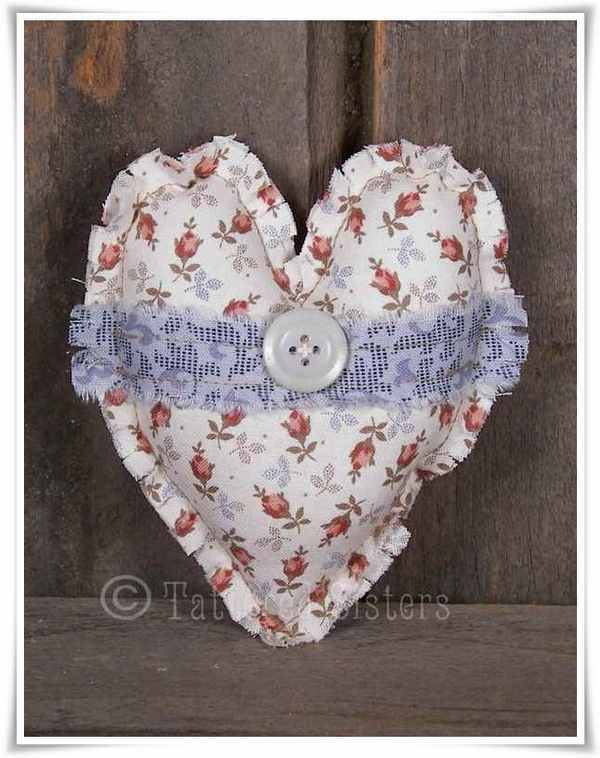 So I used some fabrics with spring and pastel colors when I made my Raggedy Primitive Spring Heart. All I did was to draw a heart shape on some cardstock and then pinned that to two pieces of fabric (wrong sides together) and cut out the two pieces. Then I got some coordinating fabric to create the blue strip across the middle of the heart, and I just cut it to a length a bit longer than the width of the heart, and a width that just looked right to me. I sewed the blue fabric strip to the top of the heart shape first. Then I sewed the two heart shapes together, but leaving an opening about 2" wide for stuffing. I left about a 1/4" seam all the way around the heart shapes as I stitched. I stuffed it with fiberfill, then stitched it the rest of the way closed.Then I added a cream-colored button to the blue fabric strip. 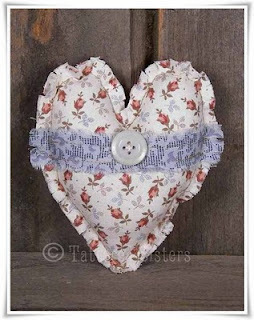 And I finished the edges of the heart by making a cut about every 1/4" all the way around the edge, to make it look a bit more raggedy and prim. 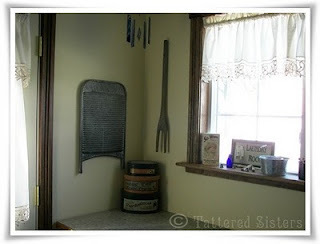 I may make some others in coordinating colors and make these Primitive Bowl Fillers. But they could also be just Primitive Ornies. Either way, I loved making it and I love how it turned out! Another spot of Primitive Home Decor is in my Prim and Vintage Laundry Room. 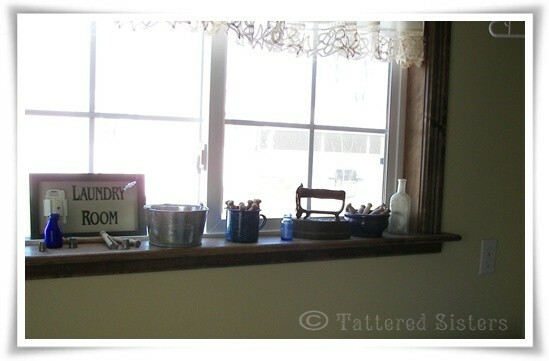 I love my laundry room, and I love all the little prim and vintage touches in there. This is just the window area...but it's my favorite part! 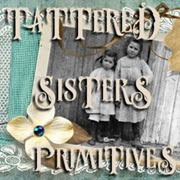 I thought it was time to add some more Primitive Home Decor posts here at Tattered Sisters. So I started getting a little photo happy as I was wandering around the house today. 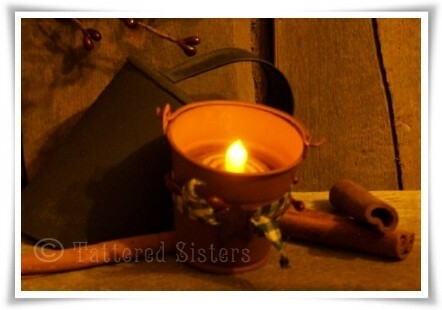 I started in the kitchen, which is where this Primitive Mason Jar Light lives. It sits right next to my Hoosier Cabinet. 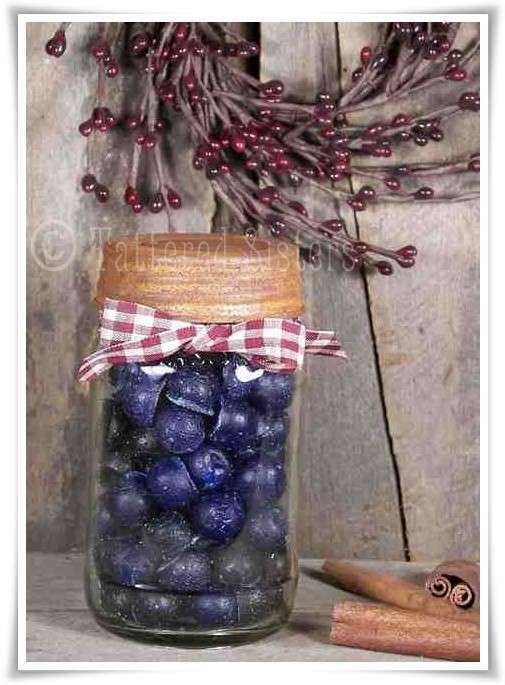 I love the look of Mason Jars anyway. So when I got this lamp a couple of years ago, I was thrilled. I knew it would probably end up the kitchen, but I debated on putting it in the living room for awhile too. It's got rosehips in the bottom of it right now. But sometimes I change out what's in there. In the fall I often put little putka pods in there since they look like little pumpkins. That's what I love about this lamp: it looks prim, but I can change it with the seasons too! I should make some more of my Robin's Eggs and put in there. That would look so neat!